When the seasons change around here, I love to change my hand soap in the bathroom. Usually, I go for something festive or for something that is the COLOR of the season. At Christmas, I may have a peppermint scented soap. During the summer, I love to have fruit or floral scented soaps. In the fall, there are so many different kinds of pumpkin, apple and fall scented soaps...it is hard to pick out one favorite! The spring time calls for something perky...maybe just a pretty pink or green soap, to remind me that spring is a time of fresh and newness. :) With fall just around the corner, I have been looking to rid myself of the fresh strawberries scented soap in the bathroom and replace it with something warm and autumn themed. Ahhh...I love fall!! Bath and Body, Body and Bath, or bath body, body products, the whole body works, no matter how you say it, The Stratford Apothecary brings you the finest, most unique beauty products for the ultimate in unique skincare products. Our line of products include body unique fragrance choices of body lotion, soap, organic soap, cream, and moisturizers. Unique is an understatement when talking about items of a single scent or a combination of scents from The Stratford Apothecary. Sure, you can find jasmine, magnolia, rose, and lavender scent products. We won't put them down, they are beautiful and long loved scents, but have you ever smelled Fig and Pear, grapefruit and orange, or Coconut and Banana soap, hand cream, or body moisturizer? The same is true for our home products which include natural candles room fragrance diffusers and sprays. We know you will love these scents around your own home, we have packaged them in gift sets, fragrance diffusers, natural candle, body lotion, hand cream, lotion, bath salts, and shower gel. As a huge fan of beautifully scented things, I have found The Stratford Apothecary carries some gorgeously scented products. All products have seemed to be unique and things that I cannot find anywhere else. So, for this review I was sent the Green Scape Foaming Hand Wash With Organic Honey. I am definitely putting this on my bathroom sink for fall because it is such a warm orange color. This soap is gentle, mild and very lightly scented. It contains Organic Honey to moisturize and nourish your skin as well as other skin-enhancing ingredients such as Aloe Vera, Sea Kelp and Fig. All of these ingredients are able to freshen and clean your skin without nasty chemicals. I was really happy with this light soap, as it was really foamy yet very easy to rinse off my hands. Usually, I have to rinse and rinse in order to completely have my hands free of soap. This worked nicely for me. Afterwards, my hands were definitely not dry and did feel clean. Green Scape Foaming Hand Wash With Organic Honey is available from The Stratford Apothecary's website and it retails for $10.97 for a 17 ounce bottle. 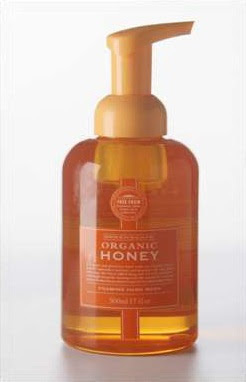 So, in my opinion, the Green Scape Foaming Hand Wash With Organic Honey from The Stratford Apothecary is a wonderful product! I love the color of this soap as it will nicely compliment the fall weather here in my home. It is a nice "green" product to have on hand as well and I don't feel badly about letting my family and friends use it as I know it is safe for them. I love it and do recommend it to all of you!! Visit The Stratford Apothecary, then come back here and leave a comment letting me know which product you like the best. :) You do not have to be a blogger to enter, but you must have a valid email where you can be reached should you win. If you do not leave an email address, it must be where I can easily find it. This giveaway is open to US residents (lower 48 states only) and will end 9/29 at 11:59 pm EST. The winner will be chosen using random.org and will be notified by email. The winner will have 48 hours to respond, or another winner will be selected. Disclaimer: I received no monetary compensation for this post. I did receive free Stratford Apothecary product for review purposes. All quotes and stock photos are from The Stratford Apothecary website and email. All thoughts and opinions are 100% mine. Ohhh I'd LOVE to try the "Green Scape Salt Scrub" in cocoa butter! I like the honeysuckle fragrance bar soap. I'd love to try their Castelbel Drawer Liners - Lavender Fragrance! I liked Stratford Apothecary on FB! I"d like to try the Kiwi & Lime Castelbel Soap. I don't see a page called Specials, but I would love to try the Shea Butter Salt Scrub! I would like to try the Green Scape Salt crub in Honey. the Kiwi & Lime Castelbel Soap. My favorite is the Tropical Fruits Sugar Scrub - Coconut & Banana. I'd love to try the Homemade Body Cream with Bergamot, Kiwi, and Wheat. I like the grapefruit and orange lotion! I would want the Grapefruit and Orange Moisturizer hand lotion! Id like to try the white jasmin soap. Anything Lavender but I would be willing to try any of the seascapes stuff too! I like the Castelbel Portus Cale Fragranced Candle in Floral Toile Pink Lily and White Tea scent the best. I like TheApothecary on facebook as Janel Myers. I voted for you on Picket Fence Blogs on 9/25. Liked stratford apothecary on facebook. Kiwi & Lime Castelbel Soap sounds lovely. I bet it smells heavenly. The Tropical Fruits hand lotion in Coconut & Banana sounds good. The Green Scape Foaminig Hand Wash with Cocoa Butter sounds really nice. I Like TheApothecary on Facebook. I like the Organic Green Scape Hand and Nail Creaml With Honey which pairs nicely with the hand wash. I'd love to try the Sand Dollar Island Revitalizing Body Splash. I would like the coconut banana body moisturizer. I'd like to try the Castelbel Portus Cale 228g / 8 oz -Fragranced Candle. I love the lemon and sage bath and body soap! Delicious. i'm following you on Twitter as @mercedesmy. I follow via google and like the honeysuckle fragrance bar soap. grapefruit and orange room fragrance - I LOVE citrus! I'd love to try the White Jasmine Bath and Body Soap. I like the Castelbel Bath and Body Soap in Orange. I would like the Lavender with Exfoliant soap. I like the sand dollar candle.